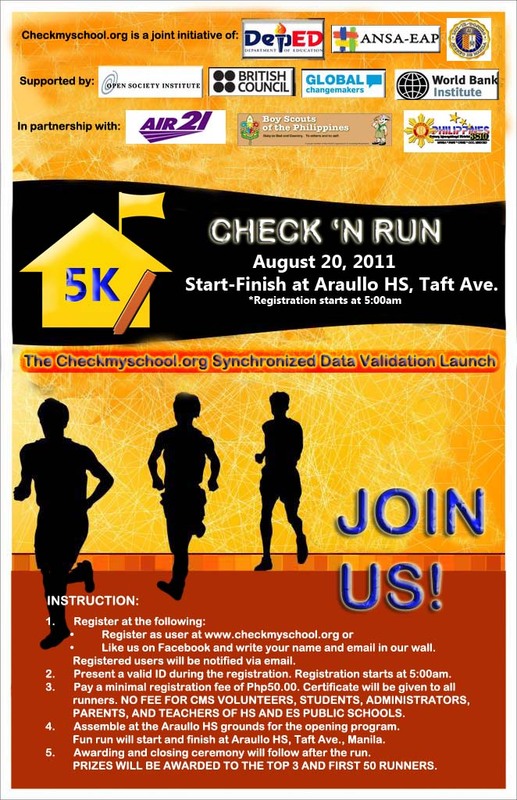 To promote social accountability in the delivery of basic education services, Checkmyschool.org (CMS) will launch Check N’ Run: The synchronized school data validation activity of school information for both public elementary and secondary schools. The activity will run from August 20 to September 3, 2011 in different areas nationwide. Harmonized with DepEd’s Basic Education and Information System’s July 31 cut-off schedule for its start-of-school-year inventory, the activity aims to enhance the integrity of DepED information through the community’s direct validation of reported information on enrolment, personnel, textbooks, seats, rooms, computers, national test results, toilet and budget. It shall be synchronized for all 200 pilot schools in 13 areas nationwide. To jumpstart the synchronized school data validation activity, a series of launching activities will be conducted in 13 different areas nationwide from August 20 to September3, 2011. Among the launch to be conducted nationwide are: (a) Fun Run at Araullo high school, Manila on August 20, (b) Fun Run at Plaza Luz, Pagadian city on August 20, (c) Kite Flying at Paseo del Mar, Zamboanga city on August 9, (d) Merry-Making at Tacloban city convention center on August 24, and (e) Lunch for a Cause at West Visayas State University Function Hall, Calinog, Iloilo on August 24. The synchronized activity involves the local school boards, government agencies, private sector, and citizen volunteers including parents, teachers, and students of public schools who will work together towards promoting social accountability and transparency in schools. Schools volunteers validate the Department of Education information, and upload the community validated education information in the website. Checkmyschool.org is an information, and communication technology initiative which combines the website facility and the community mobilization to provide easy and reliable access to information. Its purpose is to promote transparency and social accountability to provide better service delivery in public schools nationwide. This project is a joint initiative of the Department of Education and the Affiliated Network for Social Accountability-East Asia Pacific (ANSA-EAP). It is supported by Open Society Institute, British Council’s Global Change Maker, and World Bank Institute. To know more about the project, visit www.checkmyschool.org or our Facebook fan page: Checkmyschool.org. hi .. sobra saya ng check ‘n run 🙂 hahah enjoy … nxt time po uLit 🙂 saLamat !